June brings thoughts of summer days and strawberries and cream. This recipe uses both for a topping made of strawberry purée and whipped cream on a light sponge. It’s so delicious! You will need a 20cm/8in deep round cake tin and a food processor or a blender. Line the cake tin with silicone baking parchment paper. Heat the oven to Gas 2/160C. Whisk together the eggs and yolks, lemon zest and caster sugar over a pan of hot water until thick. Fold in the sieved flour and melted butter. Put into the tin and bake for approx 35-40 mins or until firm in the centre to a fingertip touch. Remove onto a cooling rack and leave to get cold. Slice the strawberries and sprinkle with the lemon juice. Purée them in a food processor or with a blender until smooth. Whip the cream to soft peak only then fold in the purée. Taste for sweetness, adding icing sugar if necessary. 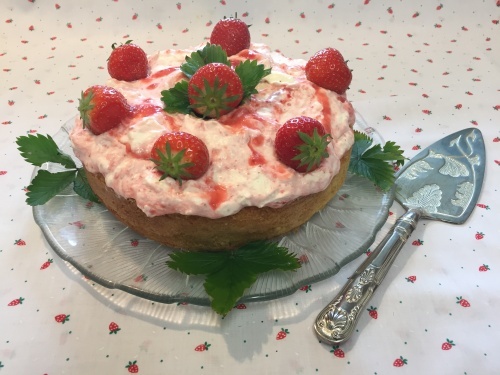 To assemble: place the cake base on a serving plate, spread the strawberry cream on top, swirling it. Decorate with a few extra strawberries. Tip: a tablespoon of white wine could be added to the strawberries. The unused egg whites can be frozen for another time.